Sean Dyche isn’t overly concerned by Burnley’s current struggles in front of goal. 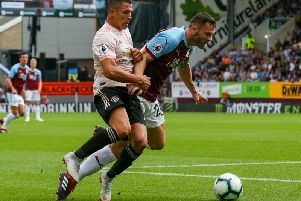 The Clarets are without a win in 10 Premier League games, in which they have scored only five times – twice in the first half on Boxing Day in the 2-2 draw with Manchester United. But, conversely, only leaders Manchester City, United and Chelsea have conceded fewer than Burnley’s 24 goals against,in the first 27 games of the campaign. Indeed, they have shipped only seven first half goals in 30 games in all competitions so far this term. Dyche just feels his side are coming out on the wrong side of the tight margins. While his side have lost five of their last 10 league games, they have only lost once by more than a solitary goal, and he said: “We’re not conceding a lot, not scoring a lot. We weren’t conceding a lot at the beginning of the season and not scoring loads, but we were edging things in games, with a slightly better quality of chance.